Gene O’Neill is a writer who knows a thing or two about life. He was a US Marine, a boxer, and played college basketball. He’s held a variety of day jobs, and only began seriously pursuing writing in his forties. With more than one hundred works of fiction published since then, ranging from his Cal Wild series (including The Burden of Indigo and The Confessions of St. Zach, among others) to his 2012 Stoker Award Winning novella The Blue Heron, he’s become a force to be reckoned with in the speculative fiction community. His short fiction has appeared in Twilight Zone Magazine, The Magazine of Science Fiction & Fantasy, Cemetery Dance, and numerous anthologies. In this issue of Apex Magazine, we are delighted to share with you Mr. O’Neill’s short story “Pale Skin, Grey Eyes.” Although he’s a busy guy, he also took some time out of his schedule to participate in the following interview. 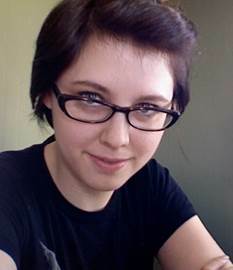 APEX MAGAZINE: What inspired you to write “Pale Skin, Grey Eyes” initially? GENE O’NEILL: A number of reasons, some I suppose are subconscious. I taught adaptive P.E. back in my youth, came in contact with a number of *disabled* people. I found many of them to be inspiring and often the people around them were awesome. I won a national non–fiction writing award about a youngster I took to the California Wheelchair Games twice, and he won two gold medals. But he died shortly thereafter. So a number of my best stories deal with similar situations, “Dance of the Blue Lady,” Jade, and Doc Good’s Traveling Show to name three. I really like the brother and sister in this story. AM: The setting is a nebulous future, in which people live in walled cities they never venture outside of, and where the patriarchal system is firmly cemented by a strict religiously–centered government. However, despite the prevalence of common belief, the children (Tem and her brother L’Voli) seem skeptical of their own local beliefs. Why did you choose to use the two of them as a moral compass for the reader in this story? GO: Well, of course there are always people that seem to rise up against the bigotry of their times and society. And like I mentioned above, I’d met a number of *heroes* in my work in adaptive P.E. And with so much negativity going on in the media, much of it centered on religious conflict between peoples maintaining outdated beliefs, I thought it a natural background to tell a story — hopefully a heartrending story that makes the reader think. AM: Race relations is a subject you’ve touched on before, and is present in this tale too, regarding those called Whiteskins, Brownskins, and Blueskins, none of whom get along particularly well with each other, even after the Brownskins and Blueskins ally against the oppression of the giant, murderous race of Whiteskins. The language terms give the story a mythic tone, yet the portrayal of racism itself could easily be drawn from modern times. What drew you to this combination of the mythic and modern in portraying race in this story? GO: Well, I think that Us against Them is a timeless concept of confrontation. Modern man obviously not exempt. And placing the story in this kind of mythic context, I hope underlines the timeless nature of the problem. AM: The falling of the possible UFO is mentioned near the beginning of the story, but then left somewhat nebulous at the end, connected perhaps only by the strange mutations of the invading Whiteskin, who now has wings added as an additional tool to her deadly arsenal. Why did you choose to include the falling of the UFO, and the hints that perhaps the invader is an alien and not a Whiteskin at all, verses simply having a mutant Whiteskin appear in the city? GO: I think that gives the story some weight. Was it an alien? Or a Whiteskin? And a question you didn’t ask: Does this story even take place on Earth? The strongest stories, I think, involve the reader, require them to make decisions. And there is nothing wrong with ambiguity in a story, especially moral ambiguity (which I like). 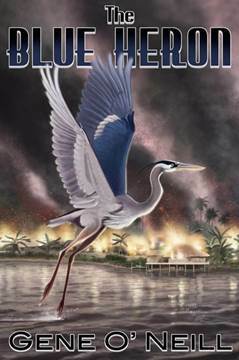 AM: You recently won a Stoker Award for Superior Achievement in Long Fiction for you novella The Blue Heron (Congratulations!). You’ve written novellas before, and it seems in the past four years that novellas are starting to come back as a major form, particularly in the horror field. Do you think there’s a chance this form may have a bit of a renaissance? GO: When I began seriously writing, oh twenty–five years ago, it was very difficult for a new writer to place a novella anywhere. A pity, because I think some of our best fiction has been novellas. Heart of Darkness. The Old Man and the Sea, Flowers for Algernon (original version), and much of our best SF. It’s my favorite form. Fortunately, the small press/specialty press has saved the form. And, yes, I do think there is a bit of a renaissance. Yay! Check out the series of novellas in Journal Stone’s Double Down series. An established writer paired with a newer writer — like the old Ace doubles. AM: You’ve mentioned before that you spend a lot of time thinking about a story before you actually sit down to write it. How long do you find you typically need to mull over an idea before you’re ready to put down words? Do you typically write every day, or more sporadically? How does the time requirement for mentally building a story impact your daily writing routine, if at all? GO: I write six days a week now, regardless. By the time I sit at the computer I have plenty of subject matter. I’ve been thinking about some of these stories, novellas, novels in mind for years. Often, several seemingly different ideas suddenly jar together and the story is ready. Usually, I have a premise, title, a main characters name, and a beginning point and ending point in mind before I start writing (sometimes things change a bit during the writing). AM: You attended Clarion back in 1979, and you’ve had some great connections with some of the movers and shakers in the SF/F industry throughout your career. Is there any piece of advice you received during the early days of your career that made a particularly strong impact on you? What about “advice” you heard or received that you thought completely off–base? GO: Damon Knight may have said something like this. You must be brave. Read, read, read as you write, write, write. Submit. Then keep your head down as the barrage of rejections shell you. During visits by other writers I take them nearby to the Valley of Moon, and show them a four foot high stack of rejections that Jack London received before his first sales. As far as ignoring something: I went to a small junior college before going on to full time college. Several years later when I began to write one of my old junior college. English teachers said that it was okay to fool around with writing as a hobby — it was unlikely that anyone like me would ever publish (he had three unpublished novels in hand). I was considered stubborn then; now I’m just persistent. AM: Although you write very dark fiction, you do not always fall back on excessive amounts of blood and gore. What, in your opinion, makes a story truly frightening? GO: I’m not sure I consciously try to frighten when I’m writing. But I’m guessing that in general suggestion is more powerful than blood splattering. In any event I’m more interested in the characters dealing with what life brings them, not so much how they die, but more importantly how they lived. Of course my degrees are in psychology and I seem to gravitate to the darker side of man. Find it more interesting. Oh, in most real horror there are always heroes and villains. I believe in neither. AM: In this age of multi–format, do you find that you gravitate towards reading e–books or physical books, and why? How has the introduction of electronic formats impacted, for better or worse, your own career? GO: Of course some of my work has been reproduced in e–book format. 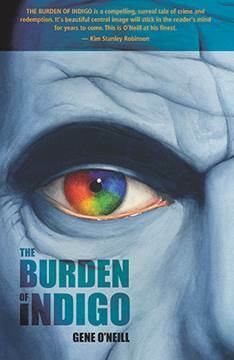 For example, The Burden Of Indigo is currently being translated to appear in e–book format in Italy. But in general I’ve resisted publishing my books in digital format. So most of my work is available for digital (or will be available for my estate down the road). Secret: I have never read anything on a digital reader. I know, I know, I’m an old fogey. AM: What have you been reading lately? Any recommendations, fiction or non–fiction, that have made a particular impression on you? GO: I just finished Salinger by Shields and Salerno — amazing, he seems to have never recovered from WWII. And I read and liked Dr. Sleep. Mostly I read non–fiction, biographies, and cosmology — stuff by Kaku and Greene. I don’t understand the upper physics and math of course. But string theory, parallel universes, and what is going on at the Hadron Collider are truly awe inspiring. AM: What do you look for in a piece of fiction you’re reading that makes you think, “Now this I like!” Are there specific elements or techniques or themes that you find particularly appealing or enjoyable to read? GO: I enjoy anything if it truly makes me think — especially a unique turn of phrase, an unusual character, a memorable ending. In fiction, I probably read as much mainstream as genre. I’m always curious about *newer* writers stuff in our genre(s), and search it out. Btw, we have a wonderful group of young writers on the rise in dark fiction, many of them women, like Rena Mason, Mercedes Yardley, Damien Walters, Erinn Kemper, and Chris Marrs to name the first names that come to mind — there are many more. Good for the genre! AM: What, if you can say, can we look forward to seeing from you in the coming months/year? GO: I’m finishing up a long novel, The White Plague, I hope by the end of the year. I have a novella solicited for a haunted house anthology of three novellas (At the Lazy K). I have an original novelette promised for a best of/ retrospective collection of my shorter work (Firebug). I’ve promised a story, “Broken Lady” for a neat anthology entitled The Library of the Dead — a great group writers in this one. I figure that will take me through the summer of next year. I may have to do some more work on the four book set of the CAL WILD Mythos — we’ll see. AM: Thank you so much! 😀 It’s great getting to interview you again!